Pick up your own copy of the Latter-day-Saint edition of the Holy Bible. 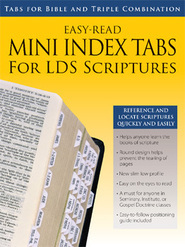 Improve your Bible study with cross-references to all other volumes of Holy Scripture, a Topical Guide, Bible Dictionary, as well as a section of maps and pictures, and footnote references to the Joseph Smith Translation. Search and ponder the word of God, a perfect gift for all denominations of the Christian faith.